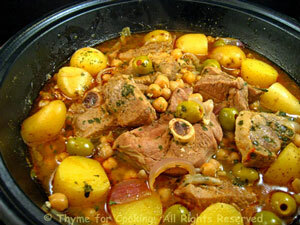 Tagine of Lamb, Chickpeas and Potatoes, easy gourmet dinner recipes. You can use a tagine (if you happen to have one) for the lamb but a large skillet works just as well. 'Tagine' is both the name of a cooking vessel and the method of cooking - even if it's in a skillet. Substitute pork if you prefer. This is a great dinner party dish as there is so little work involved. Lamb with a Moroccan influence: a bit spicy, but not hot (my preference). Add hot sauce or harissa if you like the heat. Heat oil in large skillet or tagine. Add lamb and brown well. Remove to a plate. Add onion, garlic, cumin, paprika, ginger, and sauté until onion is tender and starting to brown. Return lamb to tagine, add stock, reduce heat and braise for 30 minutes. Add saffron to skillet and stir well. Tuck potatoes around lamb, cover and braise 20 minutes longer. Add chickpeas, olives, parsley and braise 10 minutes longer. Uncover, admire for a few moments, inhale the aroma, spoon meat and vegetables onto a platter and serve.